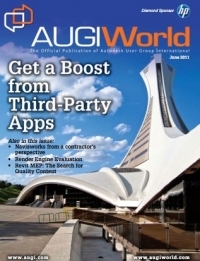 The June edition of AUGIWorld arrived in my inbox yesterday. I “flipped” through the magazine and read a couple articles that caught my attention. One features Norton Healthcare, which is just down the road in Louisville, KY and the other profiles Southland Industries use of Autodesk’s Navisworks. “Navisworks Manage, from a Contractor’s Perspective” (pages 36-40) by Chris Lanahan, BIM/Cad Manager at Southland Industries includes discussion on placing and rendering RPCs in your projects. The expert walks you through a recent large hospital project he completed and provides numerous insights into his workflow. There are several useful screen grabs that highlight materials/texture mapping, lighting, ArchVision RPC placement, effects and rendering. He also discusses the merits of providing clients visuals, to impress, win jobs and communicate design concepts. (Of course, we like this quote: “The next tab to visit is RPC. This tab is used to add fairly realistic people into your renderings.”) If you’re a Navisworks user, the article is worth a read.